But wait a second... let me back up in time a little bit. The refrigerator had been making death rattles for a couple of days, but we hadn't had time to go out looking for one. In addition, we didn't have the $1,500-$2,000 that most new refrigerators will cost you. 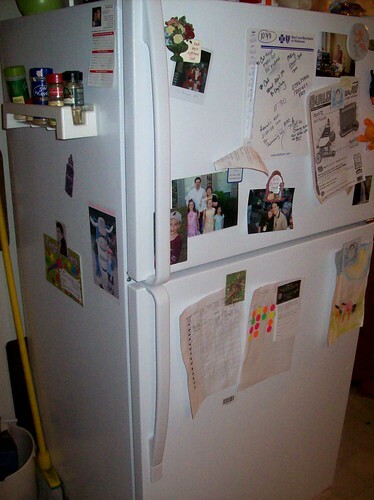 In fact, we didn't even have the $300-$500 that most used refrigerators will set you back. We've been struggling financially for a few months because of some bookkeeping errors on my part, and at the time I was under the impression that when I paid all of the bills that needed paying, I would have something in the neighborhood of $0 left over to buy refrigerators with. That is not enough to buy a refrigerator, at least nowhere I know of in Tulsa. So anyway, at the time that we started hearing the loud unnerving sounds coming from our 35-year-old refrigerator, Cathy and I both prayed that it would last until we had time to go shopping for a new one. So apparently, that time occurred Saturday morning. Cathy discovered that the stuff in the freezer had defrosted, so we took everything out that absolutely needed keeping cool and I shuttled all of it over to my mom and dad's house for temporary storage. When I got home, Cathy was watching a program called Time on The Science Channel. It struck me as being kind of theoretical for her... she generally tends to be a very concrete-minded person and this show was all physics-y and space/time-y and I was honestly surprised she was putting up with it... apparently she likes science a lot more than I realized. When I got there and started watching, they were showing these white rats that had been trained to push a button. They gave one rat saline solution for a control group. He pushed the button in the normal amount of time. Then they gave another rat cocaine, and he pushed the button REALLY fast, and they gave another rat marijuana, and he pushed the button REEEEALLY slowly. They went on to explain that it appears that different chemicals seem to be able to slow down or speed up our perception of time, and that time appears to be largely something that exists in our minds. Then why, they asked, does time only move forward and never backward? The reason they came up with is that it is possible for time to move in a reverse direction, but that we never see it happen because it is highly improbable... so improbable that there is virtually no chance that it will ever happen in the lifetime of our universe. So I was thinking... this physicist on my TV who just spilled and un-spilled a cup of coffee (cool camera trick, there, Galileo!) is coming this close to saying that time is essentially an invention of our own minds and does not actually exist at all. And then it occurred to me that most Christians believe basically that God exists outside of time and that human beings are placed within time by Him... essentially that time was created for our benefit. Strange how science always seems to loop back to Theology somehow. So anyway, by that time we had to leave for my 7-year-51-week-old Mikey's soccer game, so we went to that and then dropped him and his infant sister off with grandparents so we could go fridge-shopping. We decided to take our time and head to a handy Lowe's and the Home Depot next door to it to see what might be available. On the way Cathy was like, I really want one with see-through trays, and this and that, and I was like, OK. We're in a financial bind right now, so my first reaction to that is to say, we'll take what we can get because we don't have the money to be choosy. But instead, let's go with my second reaction, which is to pray for God to lead us to just what we want at a price we can afford. So I asked her to pray, and she did. And so we progressed on to Home Depot. Before we got to Home Depot we spotted a Maytag Outlet Store, and decided to look there if we didn't see anything else good. So we looked at Home Depot... nothing we liked. Nothing good in our range at Lowe's, either. So on we went to the Maytag Store, where we found two identical refrigerators in their "blemished" area. Now, appliances that are considered "blemished" sometimes have visible damage, usually minor, but in this case, there was no visible damage at all. And these refrigerators had the see-through trays Cathy wanted. And they were not smaller than the dead one, which was a concern of mine. And they were marked down from nearly $900 to under $600! Wow! So we wanted to buy, but because of our financial struggles I was afraid that financing wouldn't happen this time. The most cash I could come up with immediately was about $150, and I didn't think they would knock that much off for me! I grabbed a credit app off their "90 days same as cash" display anyway and filled it out and gave it to our salesman... I figured in a pinch, I should be able to squeeze blood out of a turnip for three months and get that $200 each month somehow and pay it off in time so I didn't have to pay that 22+% interest. So the guy submitted our credit application, and not only did it come back approved (for a much higher credit line than we needed! ), but it was approved for TWELVE MONTHS same as cash! And I KNOW I can come up with $50 per month for twelve months! So one borrowed pickup truck and one helpful dad later, I had a brand new refrigerator at my house, all set up and ready to go. It was exactly what we needed, and probably a slight bit larger than the one it was replacing, especially in the freezer part. An answer to prayer? Clearly! God knew better than we did what we needed, and He provided it. Here's the rub, though. When we prayed, that fridge was already at the store. It was already marked down to the price we bought it for. Our credit score was presumably the same before we prayed as after. So if God provided it, He must have provided it days or even weeks before our old refrigerator went out, timing everything exactly right so that those fridges would be in that store, our credit would be in a certain state, maybe that specific salesman would be on duty to help us out, we would happen to spot the Maytag store on the way to the other stores... everything would be just right. If God lives outside of time, it doesn't matter if we pray today and the answer requires six months to happen... God knows what we will pray for, when we will pray it, and when we will need the answer. "My Trust in My Lord"
Thus begins one of the most eloquent and reasoned posts about the Christian faith that I have seen in a long time. Did I mention that it was published jointly by the we-have-a-reputation-for-being-liberal Washington Post and Newsweek? Oh... and that it was written by vampire-novel-author Anne Rice? Which Bible character would you vote for? I am crazy frustrated with the presidential candidates for the upcoming election. Ahhhh… Maybe you've already selected the "perfect" leader from what seems to be a very "imperfect" list, but I'm struggling. So in a loving and irreverent nature, how about we push the envelope a little and ask "the forbidden question"? Limited to the candidates below, who would likely get your vote for president?